I am getting a nullpointerexception during ksession load due to a null cmdScopedEntityManager (from JpaPersistenceContextManager). This cmdScopedEntityManager was not initialized yet though. 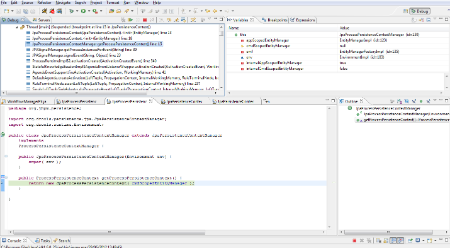 It seems to be lazy initialized during beginCommandScopedEntityManager (from JpaPersistenceContextManager). Is that a bug or is there some way or something else I need to add to my environment to use this properly? could you upload your process definition and some details about your environment setup so we could verify if that is an issue or any configuration is missing? I'm using jbpm 5.3 on tomcat with spring and Bitronix. Postgres DB. The process definition is not big... there is a lot of calls from my framework which I must say call no Jbpm methods. The important part is the two conditionalEvents that lead to one line of execution reach the end event and the other being blocked. When restarting the server the deserialization fails. I get the exception below caused by a null pointer exception as already mentioned on the first post. 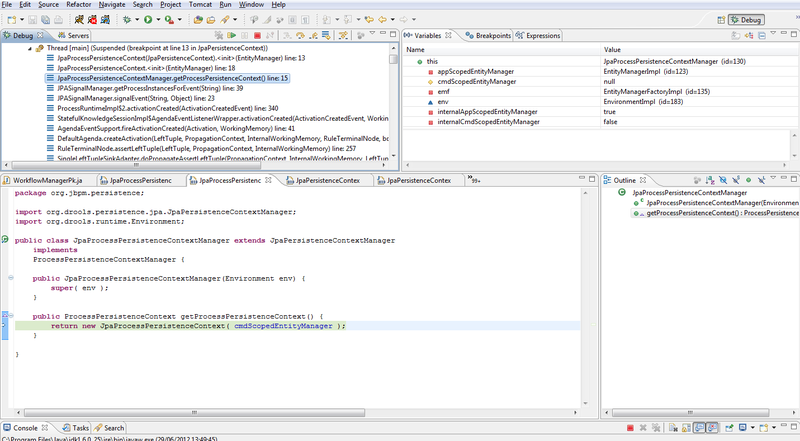 Maybe it is worth to mention that the var appScopedEntityManager is initialized. do you mange transaction your self? If not remove UT from the environment and let jbpm to handle transactions internally. What solved for me was to bypass the current JpaProcessPersistenceContextManager implementation (which may still have a bug... I would make some tests).